The PopSugar/TechCrunch Geek Goes Chic party in Los Angeles is over. The final count – over 1,300 paid attendees plus another 800 on the private guest list. In all, over 2,100 people attended the event last Thursday. It was our largest event to date, twice as large as the thousand-person events we normally have. And based on feedback, it was a lot of fun for everyone. The only problem was that there were so many people, distributed in three main areas, that it was nearly impossible to find anyone that you were specifically looking for. We’re hoping to have a messaging system on a big screen at the next party to help people find each other. As always, we’re donating 100% of the proceeds from ticket sales to charity. We charge $10 to get in the door primarily to reduce no-shows, but we’ve been able to donate tens of thousands of dollars to charity from the gate fees from previous events as well. This time we’re splitting the proceeds between the OpenID Foundation and the DataPortability WorkGroup. Each will receive $6,625 to further their goals of opening up identity and data on the Internet. Thank you to everyone who attended. At one point I looked around and saw nothing but a sea of people, and took the picture to the right (and that was just 1 out of 3 main areas of the venue). I wasn’t able to meet everyone, but I tried. And the people I did meet came from a fascinating mix of backgrounds. Photos for the event can be found at the TechCrunchMeetup12 tag and on our sponsor site PicApp here. I also want to thank all of our sponsors for the event. 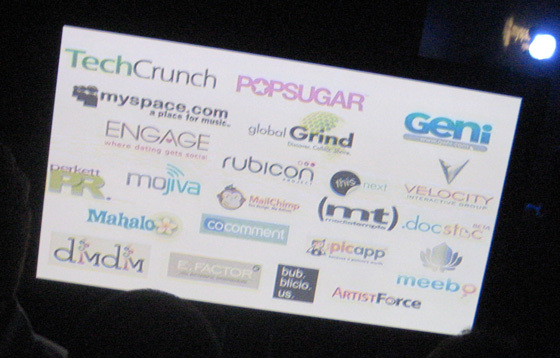 Many thanks to our platinum sponsors MySpace, Engage, Global Grind, Velocity Interactive Group, The Rubicon Project, and Geni. We also thank e.factor, CoComment, DimDim, DocStoc, Mahalo, This Next, PicApp, Meebo, ArtistForce, Media Temple, EventBrite, LotusVodka, PerkettPR, Mo’jiva and MailChimp. See more on all of the sponsors on the official party page. Lastly I want to thank the whole team at PopSugar for co-hosting the event with us. Let’s do it again next year! PS – If you’ve written about the event, leave a link in the comments and we’ll add it to the post.